Poster for the 1983 film, with subhead above that reads: 'The story of eight old friends searching for something they lost, and finding that all they needed was each other.' For many Baby Boomers who saw this film, the soundtrack was especially memorable, a fact not lost on Madison Avenue. In September 1983, a movie named The Big Chill was released — a story about eight former 1960s’ college friends who gather for an unscheduled reunion after a friend’s untimely death. The Columbia film was nominated for, but did not win, three academy awards, including Best Picture. The Big Chill did reasonably well at the box office and also in its DVD afterlife, and today still has fans online and elsewhere. But for many who first saw the film in 1983, it was the soundtrack — an evocative collection of original 1960s rock ‘n roll tunes — that was especially memorable and enduring. In fact, the movie’s music became something of a key landmark in the history of advertising, as it would help to spur the use of original rock music in a myriad of advertising applications in the years that followed. Prior to The Big Chill, for the most part, popular rock musicians sang company jingles, or advertisers used copied versions of their songs, performed by imitators and studio groups. But after The Big Chill, there was a decided turn by Madison Avenue to use original rock ‘n roll songs, or portions of them, in all kinds of advertising. “…[T]he movie probably gave far too many ad agencies the notion to buy up the rights to 60s’ songs for use in pushing the nostalgia buttons of key-demographic consumers,” later wrote Ken Tucker in The New York Times. Songs listed by approximate appearance in the film. What follows below is some history on Madison Avenue’s use of rock music in advertising; but first, a few words on The Big Chill’s storyline and its musical packaging. The Big Chill is an introspective film featuring a weekend of soul searching by the group of college friends who have lost one of their former inner circle to suicide, activist Alex Marshall (Kevin Costner played the corpse). The film’s star-studded cast included Glenn Close, William Hurt, Tom Berenger, and Jeff Goldblum, among others. The story opens at the funeral of Alex, as his death is the first unpleasant bit of reality to hit the group. They soon become immersed in a “ten-years-later” reality check on what they each have become since their college days. Included among this group of friends are: a medical doctor; an owner of athletic shoe company; a TV actor; a public-defender-turned-corporate-lawyer; an aimless and somewhat traumatized Vietnam veteran; a bored-to-tears housewife; a People magazine writer; and an attractive, somewhat younger woman who was living with the departed Alex at the time of his suicide. This assorted mix of characters retires from the funeral to the South Carolina home of one of the group, where they each work through their various feelings, concerns and hopes during the weekend. They eat, drink, cavort, reminisce, dance, smoke dope, and bare their souls. They fondly recall their college days and their causes, but also confront their disappointments and the waning of their idealism. Though never stated per se, “the big chill” has hit them; the reality that their undergraduate dreams and intentions are not being realized. Their lives and careers have not turned out exactly as they envisioned them in college. Turns out, life is more difficult and less inspiring than what they thought it would be. In the end, after the weekend of soul-searching, some find new direction, some not. Others pick up where they left off. The film’s viewers, meanwhile, are fully engaged with the message, and also with the excellent soundtrack, as music becomes a big part of the film’s take-away connection. The Big Chill soundtrack, in fact, is top shelf; some of the best music of the 1960s, placed nicely in the film’s storyline, hitting its intended viewers in their deepest memory banks and remaining in their heads for days after seeing the film. During the church scene at the funeral of the departed Alex, the campus revolutionary, one of the group begins to play a few riffs of Alex’s favorite song on the church organ — the Rolling Stone’s “You Can’t Always Get What You Want” — as the camera pans the knowing smiles of his friends’ faces. The organ riff segues into the original tune which plays throughout the funeral scene. In another scene in the kitchen where the group is cleaning up after a pasta and wine fest, The Temptations’ “Ain’t to Proud to Beg” is played, leading to impromptu dancing among friends. “The scene encapsulates the spirit of the film,” one reviewer would later write, “friendship forged in the footloose optimism of the 60’s; camaraderie instantly regained through the nostalgic power of good pop music.” (see film promo clip). Other tunes in the film — such as “A Natural Woman” by Aretha Franklin; “Wouldn’t it Be Nice” by the Beach Boys; “The Weight” by The Band; “Bad Moon Rising” by Creedence Clearwater Revival; “Tracks of My Tears” by Smokey Robinson; “I Heard it Through the Grapevine” by Marvin Gaye; and “A Whiter Shade of Pale” by Procol Harum — all fit nicely into their scenes, serving as a kind of “comfort food” for Boomers. The Big Chill soundtrack, in fact, quickly became a popular best-seller for Motown, climbing to #17 on the Billboard albums chart in 1983, selling 1 million copies by late March 1984. All of this, of course, was not lost on Madison Avenue. The Big Chill wasn’t the first movie to use original rock ‘n roll music in a soundtrack. Other films dating to the 1950s had already done so — such as 1955’s Blackboard Jungle, which used Bill Haley’s “Rock Around The Clock” over the opening and closing credits. The Beatles were among the first to integrate film and original rock music in their mid-1964 A Hard Day’s Night, which used about a dozen of their songs. Easy Rider of 1969 used rock music effectively in its score, and so did American Graffiti in 1973, the latter in a purposeful nostalgic vein. Madison Avenue, meanwhile, had a long history of using all kinds of music in advertising. However, rock ‘n roll music in advertising — especially original-version rock ‘n roll — was still new territory for advertisers in the early 1980s. Among other Coke artists doing radio and/or TV spots during this era and later years were: the Bee Gees, Neil Diamond, the Moody Blues, the Tremeloes, the Troggs, Los Bravos, the Everly Brothers, Otis Redding, the Box Tops, Leslie Gore, Marvin Gaye, the Supremes, and Ray Charles. Pepsi, 7-Up, and a number of other companies were then recording jingles with pop groups as well. In the U.K., the young Rolling Stones recorded a rock jingle in the 1960s for Rice Krispies cereal that appeared on a European TV spot. Still, most of this music was commissioned specifically for the product, and did not use original, pre-existing rock songs. The nostalgic and “associative” value of these original rock songs, aimed at specific target groups, had yet to be linked to advertising pitches. By the late 1970s, rock music was surfacing in a few other TV formats, as the 1976 Orleans hit, “Still the One” started to be used as the ABC-TV network theme song and also by the Nine Network in Australia for the same purpose. In 1981, there were musicians hooking up with beer and liquor companies in a variety of relationships, some of which involved TV and radio spots, doing company jingles, appearing in print ads, or becoming involved in sponsorship arrangements. These included Dave Mason of Traffic and later Fleetwood Mac, and Charlie Daniels of the Charlie Daniels Band doing beer commercials — Mason for Miller and Daniels for Busch. The Commodores became involved with Schlitz beer; Kool & The Gang with Schlitz Malt Liquor, Journey joined Budweiser, and The Marshall Tucker Band with Ronrico Rum. In the 1960s and 1970s, the nostalgic and “associa- tive” value of original rock `n roll music had yet to be linked to specific advertis- ing pitches. Ad agencies in the early and mid-1980s were also using some popular song melodies, but inserted their own product-specific lyrics usually performed by cover groups. As writer Carrie McLaren noted in research she’d done on this history: the Platters’ “Only You” became “Only Wendy’s”; the Diamonds’ “Little Darlin'” became KFC’s “Chicken Little”; Buddy Holly’s “Oh Boy” became “Oh Buick!”; Jerry Lee Lewis’ “Whole Lotta Shakin’ Goin’ On” became Burger King’s “Whole Lotta Breakfast Goin’ On”; Danny and the Juniors’ “At the Hop” becomes “Let’s Go Take a [Granola] Dip”; and Bobby Darin’s “Mack the Knife” became “It’s Mac Tonight.” In mid-1982, a version of the Beach Boys’ ”Good Vibrations” was being used in a Sunkist ad. By this time too, MTV, “music television,” was becoming a force. Launched in August 1981, the whole point of MTV was to use music videos to sell music. But it also had a major impact on advertising. By early 1984, for example, super pop sensation and MTV star Michael Jackson, then of “Thriller” and “moon walk” fame, had made two TV spots for Pepsi — ads that used Pepsi lyrics to the beat and sound of Jackson’s popular “Billie Jean” song in Pepsi’s “new generation” campaign. Meanwhile, on another level, The Big Chill of 1983-84 helped show advertisers the way to a new kind of advertising to Baby Boomers through the rich connection to original rock songs. “It became prevalent in the mid-’80s after The Big Chill came out,” according to Ray Serafin, an automotive writer for Advertising Age. Many of the spots that followed The Big Chill, he explained, were trying “to evoke an emotional connection.” By the time of The Big Chill , the evocative con- nection between the ’60s music and its Boomer audience had become especially ripe. By the time of The Big Chill in 1983-84, the evocative connection between the music and its Boomer audience had become especially ripe. More years had elapsed between the music’s initial popularity and Boomers’ middling years. The music had, for this group, reached its “prime-time nostalgic vintage,” and so, had a more powerful appeal and connection. In both film and advertising psychology, the music-emotion tie is a well-studied phenomenon, and has become a valued strategy. Movie producers know that the right music in a movie scene can make the scene more powerful, more memorable. Hollywood producers would pay hundreds of thousands of dollars to get the legal rights to use the right song in the right spot. Advertisers by the mid-1980s were willing to do the same. In 1985, Ford Motor Company’s advertising agency, Young & Rubicam (Y&R), became an early developer of this approach, producing a series of 19 television commercials using 1960s and 1970s music. These ads were used to pitch Ford’s Lincoln-Mercury cars. Ford and Y&R called their advertising “The Yuppie Campaign” — meaning “Young Urban Professional” or “Young Upwardly Mobile Professionals,” describing a desirable Boomer market segment. The aim of the Ford/Y&R campaign was to make an emotional connection with Yuppies, bringing back memories of when they were in college. Different popular songs were used on each commercial, some in the original, some by imitators. Back in 1985, when the Ford Motor Co. and its ad agency, Young & Rubicam, Inc., launched a series of 19 television ads with rock ‘n roll music in their “The Yuppie Campaign,” one of the songs used was a 1973 Bette Midler tune, “Do You Want to Dance.” With some of the songs Young & Rubicam chose for this campaign, they tried to obtain the original song versions. However, in ten cases the ad agency employed “sound-alikes” and not the original artists or original versions. One of the “sound-alikes” imitated Bette Midler in her song “Do You Want to Dance.” Midler by then was a nationally known actress and singer who had won a 1973 Grammy as Best New Artist, and also had recordings that had gone Gold and Platinum. She was also nominated in 1979 for an Academy award for Best Female Actress in The Rose, in which she portrayed a pop singer Janis Joplin. Midler had a long history of avoiding commercial endorsements, and in fact had refused Ford’s offer to do the ad herself. When the backup singer produced a very Midler-like version of the song for Ford — a version that even fooled Midler’s friends — Midler took legal action. In 1986-87, Midler sued Lincoln-Mercury and Young & Rubicam, alleging that the use of a sound-alike in their ad constituted “an unlawful misappropriation of her persona.” She lost her first attempt when her case was dismissed at the trial court level. But the Ninth Circuit Court of Appeals came to her aide in a 1988 decision, noting that, “… when a distinctive voice of a professional singer is widely known and is deliberately imitated in order to sell a product, the sellers have appropriated what is not theirs and have committed a tort in California.” She was also awarded $400,000 by the jury. Midler’s success — which came to be known as the “Midler tort” in California — put a damper on the use of sound-alikes. But soon, outright licensing of original songs became the preferred way to go for commercial interests, although many artists would not go down that path. In early March 1985, for example, Lincoln-Mercury used the music from the Beatles song “Help”in one of their ads — though the tune in this case was sung by other artists, not the Beatles. Still, it was the first time that a Beatles song was used in an American TV spot, and Lincoln-Mercury paid $100,000 at the time to use it. After that, The Beatles refused to allow their music to be used in commercials, though that would change after a later battle with Nike. Other artists whose music was used in the Lincoln-Mercury ads — either in the original or by imitators — included Bette Midler, the Coasters, the Four Tops, the Temptations, Tina Turner, and Martha & the Vandellas. Among artists and fans, meanwhile, there was resistance to using rock ‘n roll songs in advertising and other commercial applications. Some artists refused to allow their songs to be used for advertising. Among artists in the mid-1980s then resisting the practice were, for example, Bruce Springsteen, Neil Young, Joan Jett, Chrissie Hynde, Billy Idol, and John Mellencamp. Some music fans would object to the practice in more fundamental way. Carrie McLaren, writing some years later about music and advertising, described how she associated a car commercial with the song “Everyday People” by Sly and Family Stone. After casually hearing the song on a radio at a bagel shop, she caught herself in thought, angered by the car-ad association. Rather than remembering the artist per se, or “the everybody-can-get-along” message of the song, or even her college days when she first heard the music, her reaction took a different turn. And that for many fans — the appropriation and/or distortion of musical memory — would continue to be an issue as more and more original music was used in advertising. Still, the genie was out of the bottle by this time. Advertisers had discovered the power in original rock music and there would be little turning back. By 1986 Rolling Stone magazine had launched a separate newsletter, Marketing Through Music, aimed at promoting the use of rock music to sell consumer goods, especially to the young adult audience. The “Big Chill advertising” that began in the mid- and late-1980s was just the beginning. Some important legal fights were yet to come, including the Beatles’ fight with Nike in the late 1980s over the use of one of their songs. But increasingly, through the 1990s (see “Selling Janis Joplin”, for example ), the use of original rock music in advertising would escalate and become more common. 15th anniversary DVD edition, 1998. As for The Big Chill, the movie and music continued to have a good run for years after its initial opening. In the year after the movie’s debut, a second album of music was released: The Big Chill: More Songs from the Original Soundtrack. The original soundtrack meanwhile sold 2 million copies by late September 1985. It would eventually sell more than six million copies, becoming one of Motown’s best-selling albums. In 1998, at the film’s 15 anniversary year, there was a theatrical reissue of the film in November and a DVD version by Sony the following January. The DVD includes a retrospective documentary, deleted scenes, the movie’s trailer, and a six-page insert. “The Big Chill reasserts itself effortlessly… as an irresistibly satisfying cultural artifact,” wrote Entertainment Weekly’s Lisa Schwarzbaum at the film’s 1998 reissue. In 1998 as well, both the original and supplemental Big Chill music albums were remastered and released anew. In 2004, a deluxe edition of the soundtrack was released containing all but two of the eighteen songs from the film, plus three additional instrumentals from the film. A second “music-of-a-generation” disc of nineteen additional tracks was also included in the deluxe edition, some of which had appeared on the original albums. In 2008, some twenty-five years after its release, The Big Chill still had an online following. 'Big Chill' music, deluxe CD, 2004. Michiko Kakutani, “A Film Festival With an American Accent,” New York Times, September 18, 1983. Vincent Canby, Screen: “‘The Big Chill’, Reunion of 60’s Activists,” New York Times, Friday, September 23, 1983. Bill Sizemore, “Advertisers Put ‘Big Chill’ on Boomers,” The Virginian-Pilot, Business section, Friday, February 24, 1995, p. D-1. Carrie McLaren and Rick Prelinger, “Salesnoise: The Convergence of Music and Advertising,” and “Timeline of Music and Advertising,” both from Stay Free! #15, Fall 1998. 'Big Chill' soundtrack, 1998 edition. Carrie McLaren, “Licensed to Sell: Why the Jingle is Dead and Commercial Pop Rules,”Stay Free!, 1998. Lenn Millbower, “Talkin’ ‘Bout Pop Music,” Heroiclist.com. Steve Chapple and Reebee Garofolo, Rock ‘n’ Roll is Here to Pay, Nelson-Hall, 1977. Marc Eliot, Rockonomics: The Money Behind the Music. Franklin Watts, 1989. Russell A. Stamets, “Ain’t Nothin’ Like the Real Thing, Baby: The Right of Publicity and the Singing Voice,” FCLJ, No. 46, Volume 2, Indiana Law School (re: Bette Midler case). Stephen Holden, “The Pop Life,” New York Times, November 30, 1988. More 'Big Chill' music, 1998 edition. Ken Tucker, The New Season/Film; “Ain’t Too Proud to Obsess, All Over Again,” New York Times, September 13, 1998 [Ken Tucker is the critic-at-large for Entertainment Weekly.]. Don Aucoin, “Fifteen Years Later, `Big Chill’ Is Cooler than Ever,” Boston Globe, November 6, 1998. Alex funeral scene from The Big Chill on You Tube (6:37 min). 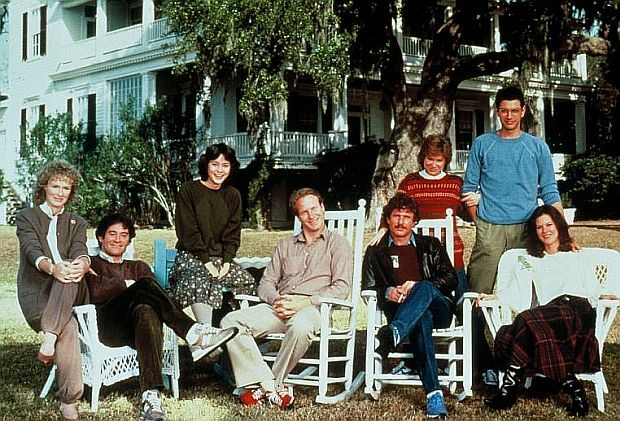 The Big Chill cast in front of the home in South Carolina where the film was shot, from left: Glenn Close, Kevin Kline, Meg Tilly, William Hurt, Tom Berenger, Mary Kay Place, Jeff Goldblum, and JoBeth Williams.